Let us bead, Let us bead, Let us bead! The imagery of fall; a ripe orange pumpkin, fuzzy sweaters, and freshly sharpened pencils as people go back to school. Why not join them and become a Student Beader at the Bellingham Bead Bazaar? We offer many fun projects for beaders at any level of expertise, and have recently printed a class book to have in store. Feel free to come by and flip through its pages as you decide which techniques you’d love to learn. The classes we currently offer include Feather Earrings, a Wrapped Cord Bracelet, Kid’s Projects and many others! Our new book outlines all of the nitty gritty class details: time, fee, and supply list. We then arrange the class to meet your schedule and voila! 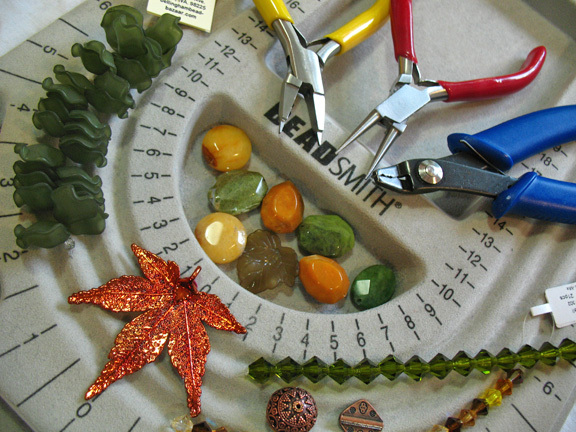 Remember, our class space can accommodate up to 6 students, so make sure to bring a beading buddy! If you can’t make it to the store, our class book is also available here on our website. All details and sample images can be found in one spot, allowing you to plan ahead on your next trip to the Bead Bazaar! Be on the lookout for more changes on our website, including a soon-to-come Events section, which will provide details on our Beading Brunch, sales, parties, and much more! Fluttering with . . . feathers! Working at a bead store means constant exposure to exciting new trends, and while chunky chains and Steampunk motifs made a strong showing, feathers reigned supreme over the entire summer and are easily working in with fall styles. From hair extensions to fascinators to earrings, everyone is accessorizing with these lightweight wonders. With any new trend comes a new realm of crafting, and we’ve been getting many inspired people with questions about working with feathers. How are they best attached to earrings? Do they need to be sterilized? Can beading crimps work for putting the extensions in your hair? Where can feathers be found? . . .
Q. How can I make a pair of feather earrings? A. 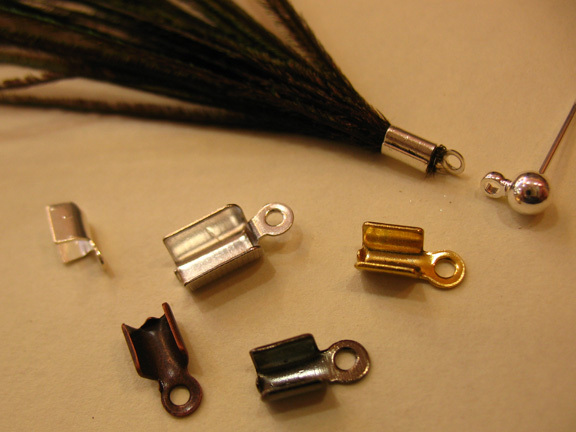 One of our recommended methods of making feathered earrings is to use a cord crimp. To make feather earrings with cord crimps, simply lay the stems of your feathers in the center of a cord crimp. Ensure that the loop of the crimp points away from the feathers and place a small amount of glue in the crimp. Then fold each side of the crimp over to grip the stem of the feather into place. Because cord crimps have a loop at the end, that can hook directly to the ear wire. If you’re an experienced wire-wrapper, creating a wire-wrapped loop and wire-wrapping around the stem of the feather is another method of attaching them to ear wires. Q. Where can I find feathers? A. Right here at the Bead Bazaar! With how popular accessorizing with feathers has become, we’ve had many requests for feathers or questions regarding where they can be found, so we’ve decided to carry them! We currently carry hackle feathers in grays, browns, and coppery tones as well as peacock eyes and spears. We’ve constructed a couple samples with our feathers and will be offering classes and free demonstrations showing how to construct feather earrings. Other sources: While fish and tackle shops generally carry feathers for lures, fly tiers don’t always appreciate having their stock depleted by beaders. Craft stores usually carry a selection of feathers, but the popularity of this trend means that suppliers are having a hard time keeping up with demand. The internet is of course always available. If you’re thinking of collecting feathers from the park or your back yard, remember that there are policies and laws in place regarding the ownership of found feathers, and make sure to read up on them. Q. Do beading crimps work for attaching feathered hair extensions? A. . . . Maybe . . . The thing is, a beading crimp is a metal piece designed to grip into a stainless steel cable and permanently affix a clasp. If used on something like thread, a beading crimp can cut through it (yes, I’ve done that before on accident). That said, we’ve had a few customers report success while using our crimp beads. This may be due to the shape of the crimp. Some of our crimp beads are tube crimps with smooth sides and no ridges at the edges, while other crimps curved inward and have a ridge around the edge for gripping. So who knows, maybe tube-shaped crimps work just fine. Whenever we sell our beading crimps for feathered hair extensions, we feel it’s only fair to warn people of the potential for crimps to cut right through hair. If you’re concerned about using beading crimps, special plastic crimps (which we do not carry) have been designed for use with feathered hair extensions. Q. Do feathers need to be sterilized before working with them? A. Probably not. All of our feathers come sterilized, and one of Bellingham’s local tackle shops has confirmed that all of their feathers are sterilized, but if you’re unsure, feel free to ask your local shops. As for the bleached/dyed feathers available from craft suppliers, it’s a safe bet that they won’t sell unsterilized materials. However, when in doubt, it doesn’t hurt to ask. We hope this was a helpful guide to answer any feather inquiries! Feel free to comment with your own hints or questions. As always, the Bead Bazaar staff is more than willing to answer them.